At times, the insane complexity of life overwhelms you, swallows you up, and deposits you at the edge of a chasm so desperately deep and terrifying that the only thing you can do is kick pebbles over the rim and listen to see whether you can hear them to hit the bottom. The icy gusts of wind threatening to pull you over don’t phase you. The cadaver birds are circling on thermals far enough below your perch that you (blessedly) cannot see what will comprise their next meal. No one seems to be around for miles upon miles and you understand only in the vaguest sense that you have neither food nor water nor first aid kit in this place. Even when the rescuers arrive and wrap you in blankets, you remain fixated on the outcropping where you so recently knelt, still not quite keyed in to the inherent danger of that space. Eventually, you find the strength to scoot far enough away from the precipice so that you’re not in immediate danger, but gusts of wind occasionally whip up over the ledge and startle you into a recognition of how close… How very, very close… It’s in that fragile place that your world simplifies so that you can have some hope that you will regain enough fortitude to attempt the trek all the way back down the mountain. You return to the absolute basics: sleep, eat, move. In that very simplest and tender of places, sometimes a messenger arrives to remind you of your own deepest wisdom. It’s rarely in a shape that you expect but that is the true beauty – you can see yourself reflected beautifully even in that which seems most unlike you. 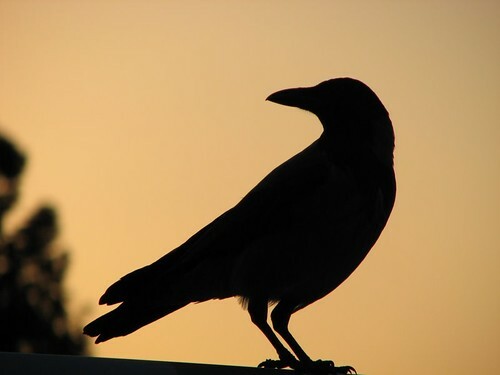 In Native American teachings, Crow has been given many attributes and is accorded a wealth of respect. The best way to listen to what Crow has to say is in the quiet times when you encounter him in his natural environment rather than seeking him through the great and electronically generated version of the world contained within our computer screens. Here are seven things Crow has to share – I hope they find you well and, if that is not the case, I hope they bring you love. 1. Be aware of your surroundings. Know what’s going on around you. Don’t let your focus be so narrow or unfocused that you miss the obvious. 2. Heights can give you a great vantage point. It’s okay to take some time to step away from what you’re doing and look at the larger picture. In many cases, it’s also totally okay if you find yourself drawn right back to where you were – at least you took the time to check. 3. Always take a moment to assess the situation. Then, take only what action is necessary. 4. Don’t be afraid to go it alone for a while. And don’t be afraid to ask for companionship when you need it. 5. Not everyone will like you – that’s perfectly fine. Do your own thing because YOU are the one most likely to be hurt by NOT doing your own thing. 6. Your intuition is strong – Go with it. Far more often than not, your gut will steer you in the right direction. 7. Expect the unexpected – You CAN handle it. With love.